Twain learned that a dozen years earlier the then-18-year-old New York-born Sawyer had been a "Torch Boy," one of the youths who raced ahead of the volunteer firemen's hand-drawn engines at night carrying torches to light the way, always aware that a single spark could reduce the all-wood city of San Francisco to ashes in an instant. At that time a mysterious serial arsonist known by some as "The Lightkeeper" was in the process of burning San Francisco to the ground six times in 18 months - the most disastrous and costly series of fires ever experienced by any American metropolis. 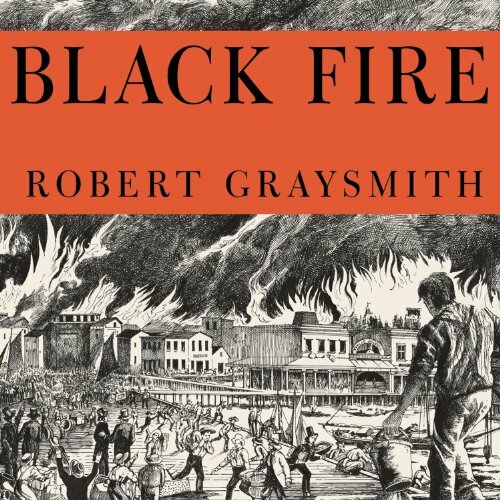 Black Fire is the most thorough and accurate account of Sawyer's relationship with Mark Twain and of the six devastating incendiary fires that baptized one of the modern world's favorite cities. Set amid a scorched landscape of burning roads, melting iron warehouses, exploding buildings, and deadly gangs who extorted and ruled by fear, it includes the never-before-told stories of Sawyer's heroism during the sinking of the steamship Independence and the crucial role Sawyer and the Torch Boys played in solving the mystery of the Lightkeeper. Drawing on archival sources such as actual San Francisco newspaper interviews with Sawyer and the handwritten police depositions of the arrest of the Lightkeeper, best-selling author Robert Graysmith vividly portrays the gritty, corrupt, and violent world of Gold Rush-era San Francisco, overrun with gunfighters, hooligans, hordes of gold prospectors, crooked politicians, and vigilantes. By chronicling how Sawyer took it upon himself to investigate, expose, and stop the arsonist, Black Fire details - for the first time - Sawyer's remarkable life and illustrates why Twain would later feel compelled to name his iconic character after his San Francisco buddy when he wrote The Adventures of Tom Sawyer. Graysmith proved himself as a riveting writer in his terrifying historical account of the Zodiac serial killer, and one of the main reasons is that he was able to place the reader directly in time and place and experience as very few can, even writers of fiction, let alone history. Black Fire does not disappoint on this account either, placing one in 1800's San Fransisco, to live for the duration of the book and driving this narrative with a central real-life character: the real Tom Sawyer (Seinfeld fans: is Clemens' great novel a kind of "reality tour?"). Some Amazon reviewers complained of length and "thickness" of the narrative, but I suspect that it is merely because texting and Facebook and other such concentration killers have made us thicker in the head and thinner on attention. Someone who can stay awake for an hour at a time will enjoy this book immensely. Perhaps Graysmith flatters himself a bit as an audio book reader here, and perhaps he might be better to continue spending his time writing pages rather than reading them aloud, but you hardly notice, the book itself is so good. One of Mark Twain's gifts was an excellent narrative flow. Robert Greysmith does not share this gift. The historical material is undoubtedly fascinating, but both the author's reading style and prose are jerky and disjointed. Jumping from incident to incident and back, pausing in the middle for an overblown description of one aspect or individual. Twain is famous for his colorful descriptions, but he has a knack for them. Robert Greysmith does not share this knack either. I wonder if the subject matter would be better served by another reader. I doubt however that even the best reader could have made this hash of information flow smoothly. I listened to it all the way through mind you. Now I have to listen to it a second or third time so that I can arrange all the parts in my own head in some way that makes sense.